Methane (CH4) is an organic molecule present in gaseous form in the Earth’s atmosphere. More than 90% of methane on our home planet is produced by living organisms. The recent detection of plumes of methane in the northern hemisphere of Mars is of great interest because of its potential biological origin, though other explanations may also be possible. Methane breaks up in the presence of ultraviolet solar radiation. Based on photochemical models and on the current understanding of the composition of the Martian atmosphere, methane has a chemical lifetime of about300-600 years, which is very short on geological time scales. This implies that the methane that is observed today cannot have been produced 4.5 billion years ago, when the planets formed. So what can explain the presence of this gas on the Red Planet? An alternative explanation is that the methane is geological in origin. It could be produced, for example, by the oxidation of iron, similar to what occurs in terrestrial hot springs, or in active volcanoes. This gas could have been trapped in solid forms of water, or ‘cages’, that can preserve methane of ancient origin for a long time. These structures are known as ‘clathrate hydrates’. Observations from the Planetary Fourier Spectrometer (PFS) on ESA’s Mars Express and from very high spectral resolution spectrometers on ground-based telescopes, have detected variable amounts of methane in the atmosphere of Mars. Could this be evidence for life on Mars? International space agencies are planning an ambitious, long-term Mars Robotic Exploration Programme to find a definitive answer to this most enduring question. 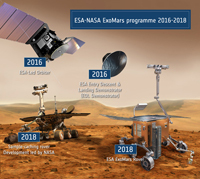 The scientific objectives of the joint ESA/NASA ExoMars programme 2016-2018 include: searching for signs of past and present life on Mars, studying the water and geochemical environment as a function of depth in the shallow subsurface, and investigating Martian atmospheric trace gases and their sources. To achieve these objectives, the 2016 ESA-led ExoMars Trace Gas Orbiter, one of two missions in the ExoMars programme, will measure and map methane and other important trace gases with high sensitivity to provide insights into the nature of the source through the study of gas ratios and isotopes. The 2018 ESA ExoMars Rover will search for two types of life signatures, morphological and chemical, with an accurate study of the geological context. Morphological information related to biological processes may be preserved on the surface of rocks or under the surface. Since the surface of Mars is oxidised, the ExoMars drill has been designed to penetrate the surface and obtain samples from well-consolidated (hard) formations, at various depths, down to 2 metres. ← Stars flicker in the heart of Orion.